Why rent from N Stuff Music? We have one of the best selections of rental products and affordable prices in all of Pittsburgh and the surrounding region. Whether its instruments, amplifiers, PA speakers, sound equipment, recording equipment, or video equipment, you can guarantee that we have it available at N Stuff Music. Our rental products are not merely for musicians and sound engineers. We have an assortment of rentals and packages available that will be suitable and manageable to non-musicians and those whom are looking for user friendly equipment to accomplish their needs. For a great selection of rental gear contact us today at N Stuff Music. Looking for rental video equipment? You’ve arrived at the right place. 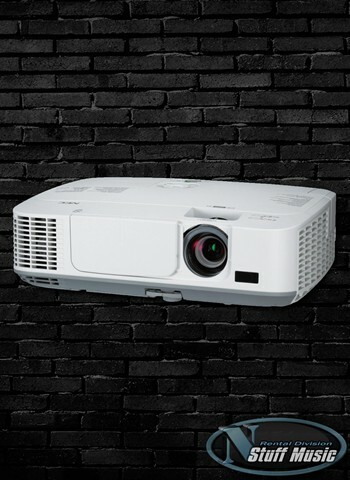 We have a video projection screen for rental with a NEC Portable Video Projector to allow you to hook up any computer and effectively project a presentation, video, data charts, spreadsheets, or anything you might need for projection. 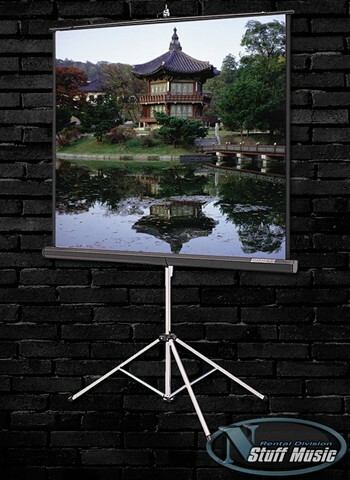 These are also perfect for slideshows, pictures, and a variety of non-corporate based, recreational functions. Pair our video rental equipment with a great live sound setup and you’ll see our corporate event package 3! This includes the high quality Yamaha Stage Pass PA system along with a microphone so that you can have high quality sound and great volume for a sizable audience. Remember, at N Stuff Music you can add on all of this sound equipment and with our rental prices it will still be minimal cost! For those of you that may question your ability to assemble video and sound gear don’t worry! Included are all of the necessary cables and parts you need for the equipment and we will gladly work with you to be sure you know how to set it up. We will even draw diagrams and color-code anything you need to prepare you for a quick and painless gear setup. For the best in rental gear selection and customer service contact us at N Stuff Music!